Enrollment in Tzivos Hashem and following its program of increasing in Torah study and performance of Mitzvos, prepares today’s children for a seamless transition into Jewish adulthood, ensuring continuity of time-honored Jewish values and traditions. World leader, Rabbi Menachem Mendel Schneerson, the Lubavitcher Rebbe, of righteous memory, was sought after by top political figures, successful business people and the finest professionals for his sage advice on matters of grave importance. He was mentor and spiritual leader to hundreds of thousands of everyday people in all corners of the globe, no one was turned away. Yet, amidst his awesome schedule, the Rebbe busied himself with the lives of children, and set out to harness their great potential. With a vision that has been unfolding and mushrooming for twenty years, the Rebbe called for the establishment of Tzivos Hashem in the fall of 1980. Children were a top priority for the Rebbe. Rather, each Jewish child was a top priority for the Rebbe. From his vantage point as world leader and spiritual giant, he understood the intrinsic promise held by children, and he founded Tzivos Hashem to cultivate and nurture them so that they could grow to be strong and healthy in body, mind and soul. The Rebbe himself would hold communal meetings, which he called rallies, with thousands of children at a time. And it was the Rebbe himself who spoke to the children directly and put great responsibilities on their shoulders. Not only did the Rebbe see children as the promise of a better tomorrow, the Rebbe saw children as the promise for a better today. Judaism stresses that chinuch, Jewish education, should begin at an early age to prepare for adulthood. The Rebbe emphasized that not only are children’s mitzvos for the sake of practicing for the future, but that their mitzvos, now, while they are young, have significance in and of themselves. Through his confidence in them and his expectations, the Rebbe actually confirmed a child’s self esteem and challenged children to use their inborn strengths and talents for good. 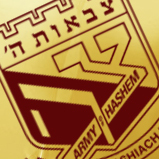 i am in tzivos hashem and I am a sergeant major its all about doing the missions there are tons of missions and if you do them you earn miles to get prizes!